Would you like to get reminders from Ms Wessel about upcoming due dates and tests? Click here to join my Life Science class. It is free, easy, and it just might give you that little extra reminder to turn something in! 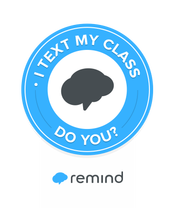 Click here to learn more about remind. Everything above this line is current for this year. Everything below the line is from previous years. Second Semester final exam covered chapters 4-7. How to draw punnett squares vid. Biotech Boot Camp for students in grades 9-10. Click here for more information or to register. Chapter 3 Science Log has been shared with you! Chapter 2: Alive...? or is it...? Chapter 2 Cornell Notes outline digital To use the digital version: While logged into your google account open the digital version. Make a copy and rename the file. The copy will be in your drive and you will be able edit. Click here to download the "Got Media?" quiz. Online accounts: what accounts to sign up for?? ?